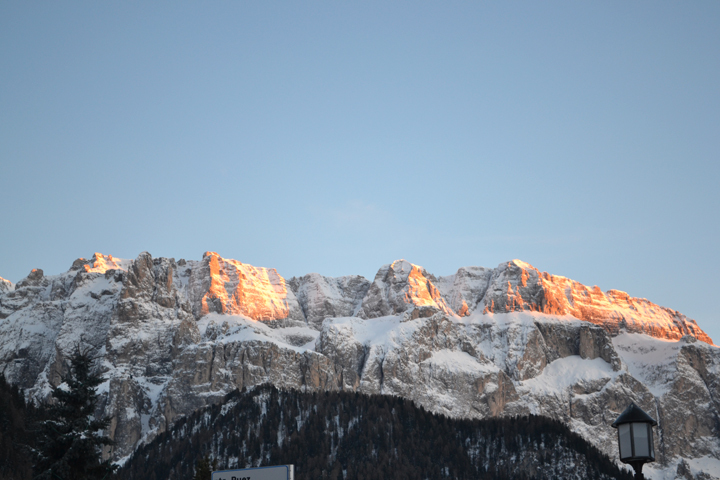 Up bright and early, we packed up the car to its full capacity with me stuffed in the back seat, and started the long 5 hour drive to Val Gardena. Traversing the southern base of the Alps, we traveled east from nearby the intersection of Italy, France, and Switzerland to just below Austria. One pit stop for prosciutto and cheese sandwiches and a long nap later, I woke up to find ourselves driving along a windy mountain road at a breakneck speed. 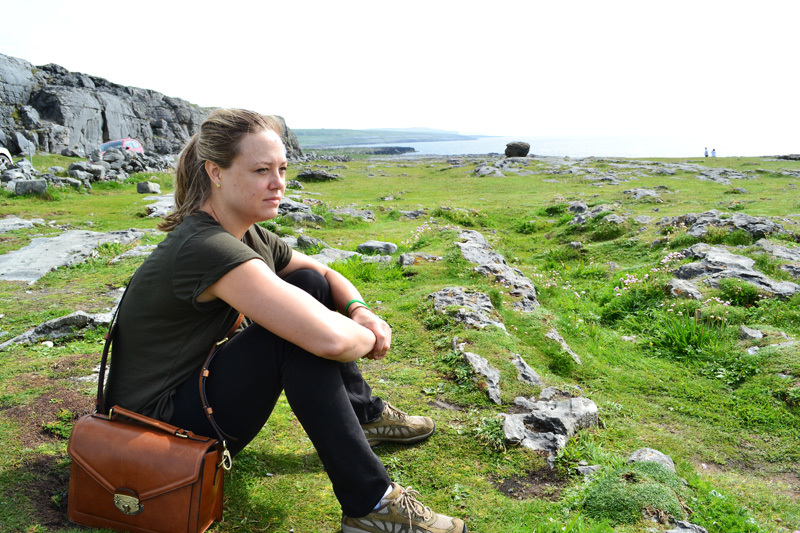 With craggy rock to one side and steep cliff on the other, I gripped my seat in a poor attempt to calm my nerves. However, one glance at the scenery distracted me to a state of complete calm. Driving through the valley (Val Gardena) of the Dolomites we encountered small villages with German architecture perched happily on the mountainside, half in sun and half in shade. I half expected to see Maria prancing across the mountain-top meadows singing “The Hills Are Alive” with the billy goats. She never appeared so I sang quietly to myself instead. 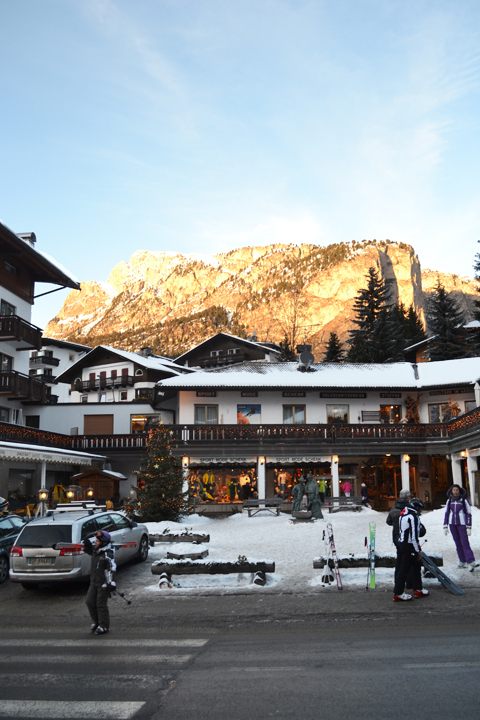 Around noon, we finally arrived in Selva di Val Gardena. 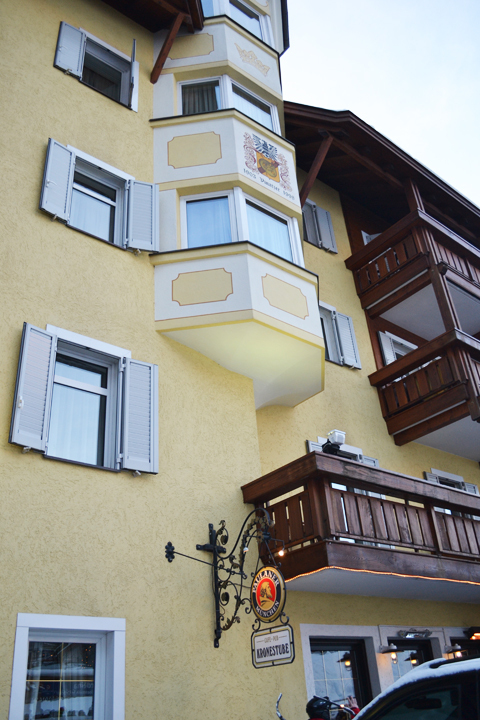 We checked into the lovely Hotel Nives and were immediately driven by the hotel owner to the local ski shop to rent some equipment. After getting our boots, skis, and snowboards, we walked down the street to pick up our lift passes. Tall, blonde, and big boned Europeans hidden beneath layers of Gortex trudged by lugging skis, poles, and toddlers with that signature ski boot clomp. This was definitely a far cry from China. Here, I was among my Central European people. 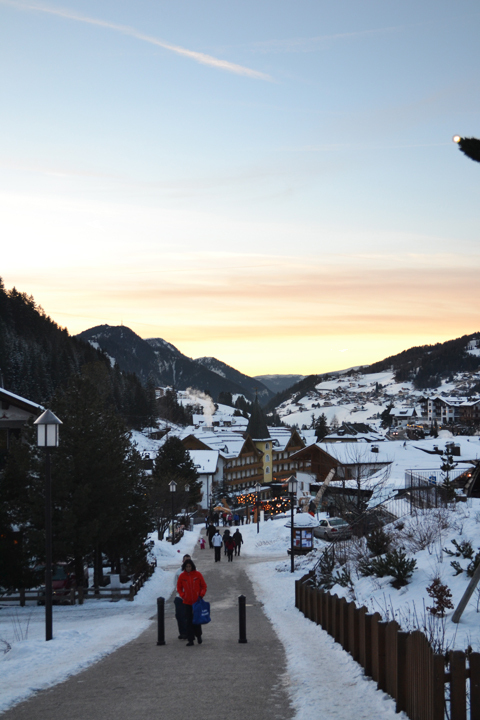 Selva is a charming village with a unique flavor of distinct German and Austrian influence. The people and culture are unapologetically not Italian. It was very interesting to hear people speaking the Ladin language distinct to this region of the Dolomites while switching fluently between impeccable English, Italian, and German. 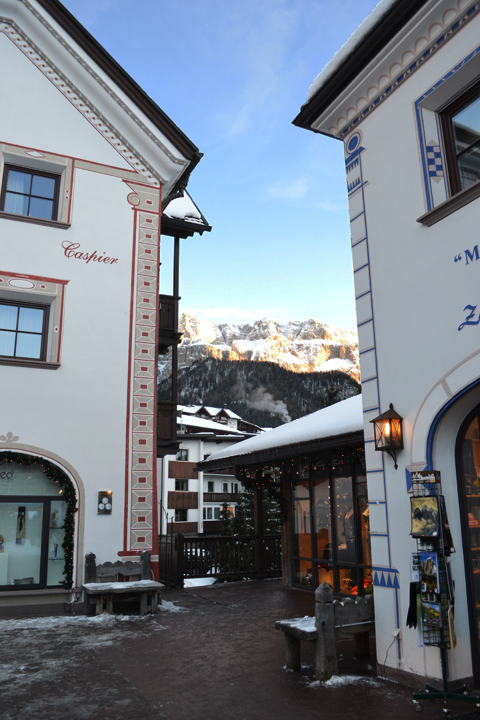 Selva and other villages in Val Gardena have a long history of woodcarving which was evident in the buildings and artwork around the village. 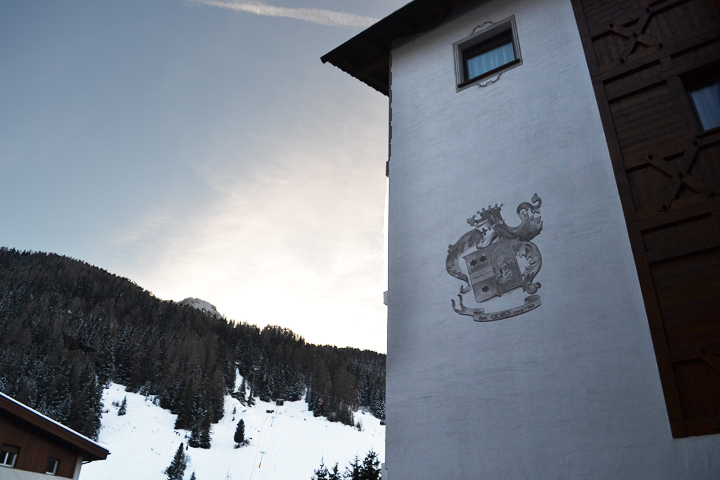 Selva, the Ladin name of the town, derives from the Latin word “silva” which means wood! Walking down the street, we encountered many wooden crucifixes and manger scenes, a reminder that we were most definitely in a Catholic state. I also saw the sign for Paulaner beer which we drank in China! Below you can see the emblem of the city. The coat-of-arms represents the insignia of the Lords of Wolkenstein who built the local castle in 1291. 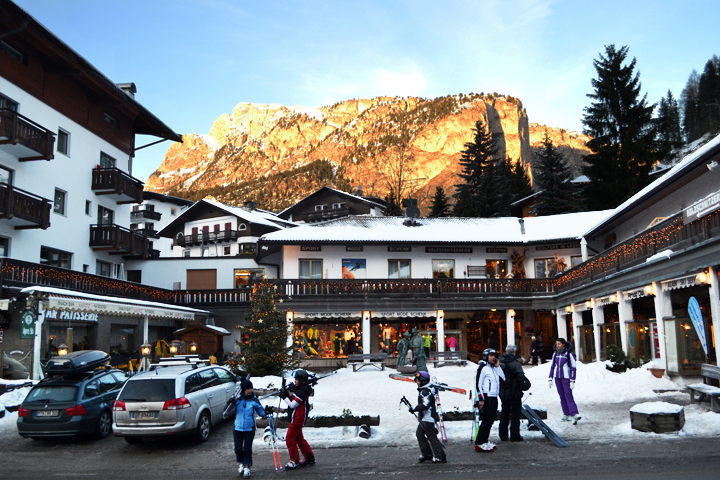 “Wolkenstein in Groden” is the German name for the town and “Selva di Val Gardena” is its Italian name. Our long walk concluded with a beautiful sunset by the pathway to our hotel. I tried keep my brain wrapped around the fact that I was indeed in Italy! It seemed like a dream come true. The air was freezing as the sun disappeared behind the mountain, engulfing the valley in shadows while illuminating distant peaks in golden light. We hurried back to the hotel for dinner and passed out early. We were excited to hit the slopes of Italy as soon as possible!